Even if you walked away from the holidays this year with the Red Ryder BB Gun you always dreamed of, you weren't the big winner this Christmas season: that distinction belongs to "Les Miserables," the long-awaited adaptation of the award-winning musical, directed by Tom Hooper. Deadline.com reports that "Les Mis" opened with close to $18 million on Christmas day (December 25), making it the decisive "Master of the House" at the box office. 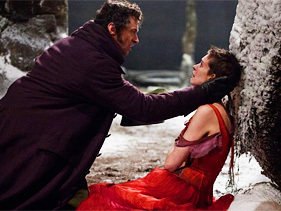 Hooper's adaptation of the beloved musical stars Hugh Jackman as fugitive Jean Valjean, a bread thief on the run from the vengeful lawman Javert (Russell Crowe). Valjean's road to redemption is populated by ill-fated factory worker and prostitute Fantine (Anne Hathaway), her daughter Cosette (Amanda Seyfried) and a young revolutionary named Marius (Eddie Redmayne). The film contains very little spoken dialogue, staying true to its musical roots, with performances recorded live on set throughout production. "Les Mis" wasn't the only holiday success story. Quentin Tarantino's "Django Unchained," starring Jamie Foxx as a freed slave turned brutal bounty hunter, clocked in at number two on Christmas day, with an estimated $15.5 million to its name. The filmmaker's latest is a Western set in the pre-Civil War south, exploring the horrors of slavery and racial supremacy — with all of the blood and bad language Tarantino is so well-known for. Both "Les Mis" and "Django" are considered major awards-season contenders this year, particularly in acting categories. Many onlookers consider Hathaway a lock for the Best Supporting Actress award at the coming round of Oscars, with Leonardo DiCaprio's "Django" villain, the slave-owning man-child Calvin Candie, at least a nominee for Best Supporting Actor. Both actors are nominated for Golden Globes. Prior to "Les Mis" and "Django's" big Christmas openings, it was "The Hobbit: An Unexpected Journey" that ruled the box office. Peter Jackson's return to Middle-earth won its second weekend in a row with $36.7 million, adding an additional $10.8 million on Christmas day. The movie has scored more than $400 million worldwide since its mid-December debut. Not every film felt the Christmas spirit, however, as Tom Cruise's "Jack Reacher" earned only $15.6 million in its debut over the weekend — about half of what Cruise earned during the opening weekend of "Mission: Impossible - Ghost Protocol" last year. "Reacher" brought in an additional $5 million on Christmas, putting its total to date at $22.9 million.